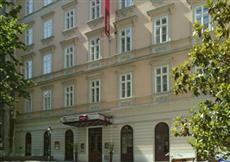 This Vienna hotel is situated near a variety of popular attractions including the State Opera, St. Stephen’s Cathedral and the Albertina. The Museum Quarter and Hofburg are also nearby. In addition, there are numerous exclusive shopping venues within walking distance. Vienna International Airport is located only 12 kilometers from the Mercure Zentrum. An airport shuttle is available for a surcharge. The Schwedenplatz underground station is located only 350 meters from the hotel, making it easy to get around and see the many sights and attractions. A total of 154 rooms are available at this hotel, each equipped with air conditioning, work desk, in-house movies and bathrobes. Daily newspapers are available. Guests of the Mercure Wien Zentrum will be treated to such amenities as 24 hour room service, laundry/dry cleaning services, bar/pub and executive floor. Massage services are available, as well as a sauna and Jacuzzi. Currency exchange services and a hotel safe are available at reception. Tour assistance is also available through the hotel.